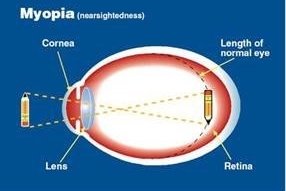 Myopia or nearsightedness is a refractive condition where the light entering the back of the eye is focused in front of the retina. When this happens, targets seen at a distance (across the room) appear blurred. Treatment includes minus lenses or contact lenses to shift the focus of the light back towards the retina. When this happens, clarity is improved. Of great consideration is the fact that a lot of school age children progress yearly or even quicker in the power that is needed to keep the world clear. Much thought and research is taking place to see how this progression can be slowed or stopped. Myopic eyes are more susceptible to eye disease, so there are benefits to slowing the progression other than having thinner spectacle lenses. 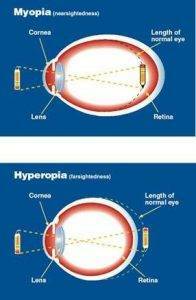 There are no shortage of theories on the mechanisms of myopia development and progression. Infant development, genetics, near work, time indoors, artificial lighting, diet; all these factors have been investigated as potential causes of/correlates to myopia. The rapid increase in prevalence alone answers the nature vs. nurture question. Myopia genes didn’t suddenly come out of hiding and turn half the population into myopes. We do know that myopic parents have children who are more susceptible to becoming myopic. Another fact is there isn’t “one flavor” of myopia, and this is why we don’t have one simple answer that fits all children. Fortunately, there are a number of strategies you can take advantage of to help slow her progression without knowing exact mechanism you’re acting on. Ortho-K or corneal refractive therapy: These are contact lenses worn during the night to re-shape the front surface of the eye. Each treatment has pro’s or con’s and should be discussed in depth with an eye care provided experienced in myopia control.